The Wisconsin State Fair is upon us once again. Over the next few days, I will be posting some great recipes connected to the "Golden Spork" Awards. The Sporkies is a Wisconsin State Fair food competition that started in 2013. This is my spin on Water Street Brewery's Chicken-N-Waffle Cone. Think about it...crispy deep-fried chicken tenders, sweet salty bacon with tangy blue cheese slaw. Held together by a fresh waffle cone...yummm! Follow step one in attached recipe if coating need to be prepared. Otherwise skip to marinade portion of directions. Note: If you like spicy chicken, add 1 1/2 cups of your favorite hot sauce to the marinade. In a large bowl, whisk together the egg whites, sugar, salt and rosemary until combined. In a medium bowl, whisk together the cornmeal and flour. Stir half of the flour into the egg mixture and stir in the melted butter. Stir in the remaining flour and allow batter to rest for 5 minutes. Follow the waffle cone maker machine directions for batter quantity. Make waffle cones and set aside. Place about 3/4 cup of flour coating in a large resealable plastic bag. Dip 1 - 2 marinated chicken pieces into flour coating; seal and shake until coated. Remove to clean plate and repeat until all chicken pieces are coated. Set aside to rest for 10 minutes. Add remaining 1/4 cup breading to dredging mixture; set aside. In a large skillet, heat 1/2 in. of oil over medium-high heat. Dredge the chicken again and shake off excess. Brown chicken on all sides and no longer pink in center; 6 - 10 minutes. Remove to a paper towel lined plate; drain well. Place 2 strips of bacon in waffle cone. Add 1 tablespoons of the slaw to the bottom of cone. While holding cone parallel to the counter, place 1 - 2 pieces of chicken in cone on top of bacon. If desired, sprinkle chicken with additional hot sauce. 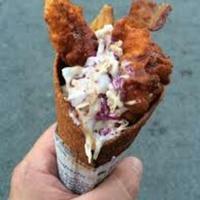 Gently spoon additional 3 - 4 tablespoons blue cheese slaw into waffle cone; serve and enjoy! Use an egg white in the waffle batter to keep the waffles light. The fatty yolks weigh it down. Let waffle batter set for 5 minutes so that the gluten can rest and won't be tough. If there is a hole in the bottom of the waffle cone, then take a piece of bread and stuff it in the bottom to prevent dripping.